Beijing (VNA) – Nearly 530,000 Chinese visitors arrived in Cambodia in the first half of 2017, a year-on-year increase of 40 percent. 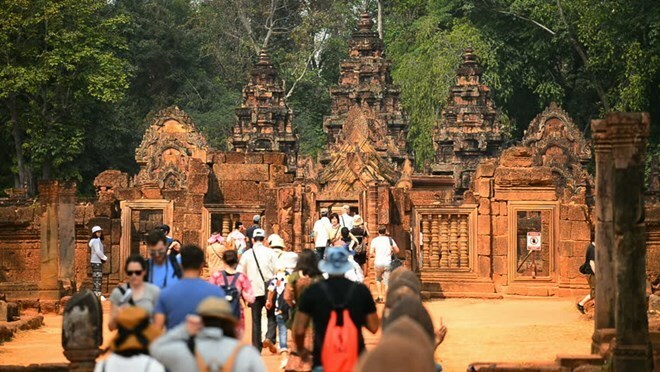 China’s Xinhua news agency cited statistics of Cambodia’s Ministry of Tourism which showed the country welcomed 2.66 million international tourists in January-June, up 12.8 percent against the same period last year, with about 20 percent from China. China had the largest number of visitors to Cambodia, followed by Vietnam and Laos. Kong Sopheareak, director of the ministry’s statistics and planning department, said excellent ties between Cambodia and China along with Cambodia’s attractive tourist sites and direct flights between the two countries are the key factors luring more Chinese tourists and business people to Cambodia. He said 12 airlines operate about 120 flights per week between Cambodian and Chinese cities. The Southeast Asian country expects to welcome one million Chinese visitors in 2017 and aims to draw two million annually by 2020.